Having long traditions in the search and development of talented children, Hungarian talent support has gained new impetus through several initiatives in the past few decades, though perhaps the most important turning point was the 2006 establishment of the National Talent Support Council by 13 civil organi - sations contributing to talent development from different aspects. The Council led by Professor Péter Csermely currently represents the 29 most prominent Hungarian talent support organisations, exerting influence on Hungarian education policy, too. Among its long-term priorities we find also the publi - cation of a book series on Hungarian good practices, as well as on international talent support initiatives and good practices, in both Hungarian and English. The Council intends to promote increasing cooperation between the Hungarian talent development initiatives and foreign partners, focusing especially on the strengthening of relations within the EU and the Carpathian Basin, supporting talent development initiatives proposed by Hungarians living within and beyond the borders. The possibility to implement these objectives has opened in the framework of the Hungarian Genius Integrated Talent Support Programme launched in 2009 by the Association of Hungarian Talent Support Organisations, established by the Council, and financed by the European Social Fund (ESF). 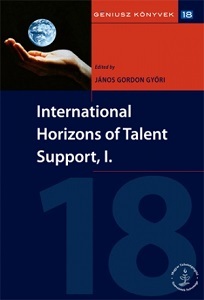 The present volume summarises the results of the Foreign Relations Research Team founded within the framework of the Hungarian Genius Programme at the beginning of 2010, made up of university lecturers, teachers, and other experts involved in practical talent support.